Good players command sophisticated instruments. They know the sounds they like to hear and want an instrument adaptable enough that they can forget the mechanics and just concentrate on making great music; Smith-Watkins instruments enable them to do just that. Musical needs vary from playing jazz and chamber music, to recording in a studio. No two players are the same or have the same requirements. That is why Smith-Watkins designs each instrument to suit the individual and their particular requirements perfectly. Finding exactly the right instrument is where the personalised service offered by Smith-Watkins, a company founded on ground-breaking academic research and expert craftsmanship, really sets it apart. Smith-Watkins is able to offer a unique service to every musician: we can measure your old instrument and find a similar one from our own range, before making any desired changes and adaptations to ensure the most perfect match between instrument and player. We are also the market-leaders inadaptable, compatible and interchangeable bells, bores and leadpipes to meet almost any conceivable musical and physical playing need. Since 2005 we have been contractors to the Ministry of Defence and have designed, made and supplied specialist brass instruments to most of the British military bands. Our Fanfare trumpets have recently been seen in spectacular form at a variety of prominent public occasions, including heralding the beginning and end of the Grand National (the most famous horse race in Britain), the Royal Wedding (2011), and the ceremonies to mark the Jubilee (2012) and the opening of the London 2012 Olympics. In 2010, Smith-Watkins celebrated 25 years of designing and building specialist brass instruments. We are always happy to provide specialist advice: please contact us using the online enquiry form, or make an appointment for a free consultation. "Unconventional, maybe; eccentric, perhaps; but then few scientists in their field can claim to have charted new territories of knowledge like Richard Smith." Yorkshire Post. Richard Smith wrote a doctoral thesis on trumpet acoustics before joining Boosey and Hawkes, where he worked for 12 years as chief designer and technical manager responsible for the world famous Besson brass range, including the original trumpets used by Derek Watkins and John Wallace, trombones for Roy Williams and Don Lusher, and the cornets used by most brass and military bands. Richard’s research work into acoustics, testing and development of brass instruments has been widely publicised in the scientific literature and on TV and radio, and he has travelled in Europe, the United States and Japan, testing instruments with top professional symphonic and session players, and presenting papers at international conferences on acoustics and instrument design. These awards were granted to only 1,000 British products and services, deemed to be challenging existing conventions and solving key problems in an environmentally and ethically sound manner, as judged by a panel of judges drawn from design, business, science and the arts. In 2008, Richard was made an Honorary Fellow of the College of Science and Engineering (University of Edinburgh), in recognition of his collaborative work within the School of Physics on the measurement and understanding of the acoustics of brass instruments. He continues to maintain a close association with Edinburgh University, and is furthering the training of the next generation of British brass instrument designers and makers through a series of apprenticeship schemes. Richard moved to North Yorkshire in 2005 and in 2010, he celebrated, with Derek, 25 years of designing and building specialist brass instruments. When you speak of lead trumpets, Derek was “Mr Lead”. 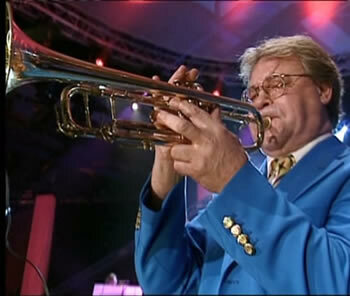 Derek Watkins had an international reputation as one of the best all-round trumpet players, making a particular speciality of the ‘Super C’! He played for Johnny Dankworth, Maynard Ferguson, Benny Goodman, Ted Heath, Frank Sinatra and the James Last Orchestra. He was Hon RAM at the Royal Academy of Music, London. He regularly played for TV shows and also gave concerts and made recordings with the London Symphony Orchestra and the Royal Philharmonic Orchestra. His last recordings included a solo album 'Increased Demand' and sound tracks for the Batman and James Bond movies.